Used this for my older Lab with Osteosarcoma; made her last few months much more comfortable. Then used the remainder for my Scottie and her coat is amazing, as my Lab's was. Buying more now for my Scottie while she's still young & healthy. I first heard of Hardy Pet on Facebook. I have two English Bulldogs and I was looking for good vitamins to support their health. One of the groups on my friends list is a breeder and they recommend your product. I have had zero health issues and I am always told how beautiful and healthy my pets are everywhere we go. My vet also says the same. I love your product! I don't know what is so good in HardyPet to turn my Fiona around, but it is working. She is an eleven year old bulldog. In October she lost her best bud Jak (our boxer) but in August she had a cancerous tumor on her shoulder removed. So she was on a roller coaster. I am happy to say she is now back to her old self. For awhile I didn't know. She is one of a kind thank you for helping her stay healthy. Q: I saw in the product description that hardypet complete comes in a wafer. How do I give it to my small Yorkie? Is it possible to break it in half? A: Thank you for your question. the HardyPet wafer is easily divisible into halves or quarters to give to your dog. Most dogs love the flavor and quickly adapt to their daily dose. Many owners use small pieces of the wafer as a treat substitute during obedience training. We hope this information helps and please let us know if you have additional questions. 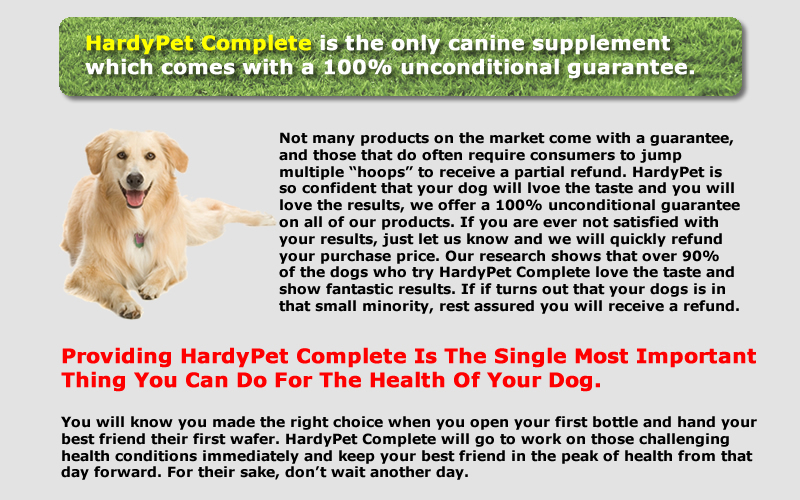 Q: I have ten litle dogs and am wondering what the dosage is for HardyPet Complete so I can determine how much to order. Nine of my dogs will be put on Complete, as one of my dogs with renal disease is on a strictly control diet with special supplements so she will not be place on it. Also, how do I find your product in Canada? A: Thank you for question. 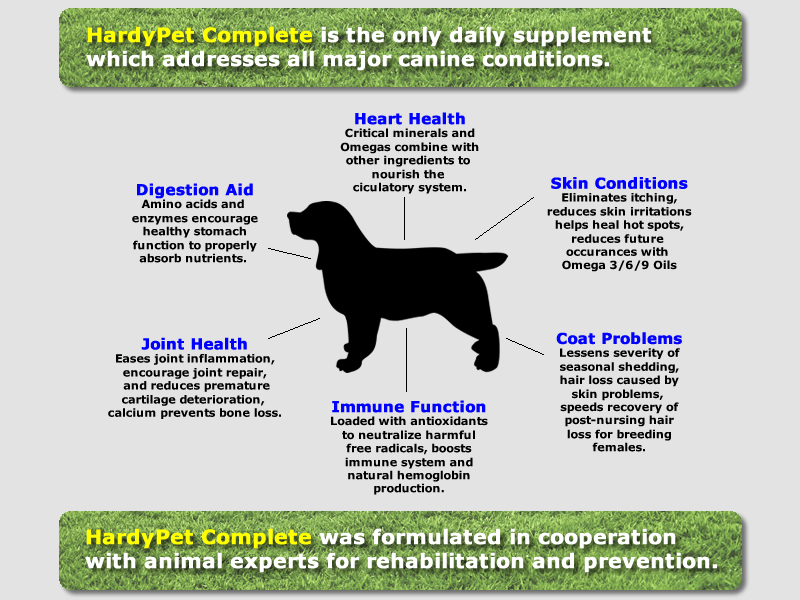 Recommended dosages for HardyPet Complete is based on weight. Dogs under 25 pounds should have 1/2 wafer per day, dogs between 25 and 100 pounds can have 1 wafer per day and dogs over 100 pounds should have 2 wafers per day. Our products are available for shipping to Canada on the HardyPet website. Q: Should I continue giving fish oil along with the hardy pet Complete?